6 tables that seat 2 each. In addition, there are 6 stackable chairs. The maximum capacity is 18. A teaching podium with an iMac, a 72" display with resolution of 1920x1080, and a DVD player. Up to 5 Mac laptops may be checked out for use in instruction. presentation practice, and so forth. To maximize its availability, we do not schedule this space for semester long classes. 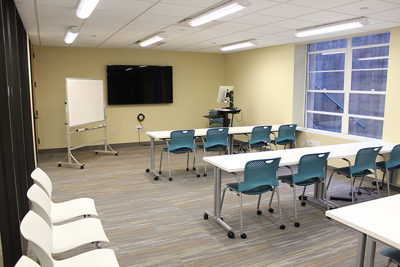 The DMC Multipurpose Room can be used by Rice faculty, students and staff. 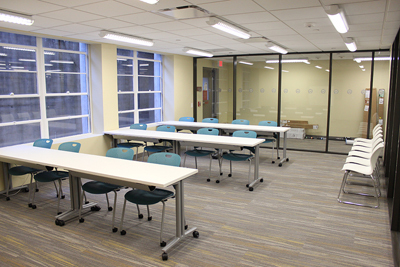 The DMC Multipurpose Room is available for booking during the DMC open hours. Reservations are up to 4 hours and can be made a month in advance.